I was recently blessed with a life-altering and dreamlike experience. Truly spiritually refreshing! I want to tell you about it. It was on a sunlit winter’s day, which followed a period of heavy snow and freezing temperatures. I had attached a pair of snowshoes onto my insulated boots and set out into the forest behind my home. My purpose was to offer words of a prayer and to place tobacco on the land for a loved one who is presently going through a rough time. The trail was physically demanding and not long after I entered the domain of sleeping trees I began breathing heavily and the rhythm of my heart intensified. My store-bought snowshoes failed to support my weight and I sunk into the deep freshly fallen snow with each step I took forward. The forest was definitely in the midst of its winter slumber. Not a sound could be physically heard in the vicinity of my snowbound trek. 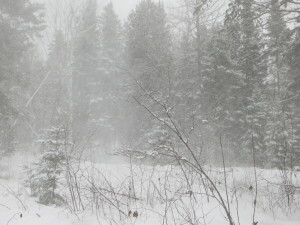 Heavy coats of snow covered the branches of spruce and balsam trees, forcing the softwood trees to point downwards at the season’s many layers of snow, one packed upon the other since the first which settled in mid-November last year. The tall white pine trees, too, were snow-laden but the strength of their branches held up and withstood the weight pressing onto them. I only travelled a kilometre before feeling that I needed a rest and sat on the remnants of an old poplar tree, fallen many years ago. As I rested I took in the beauty and peacefulness of my surroundings. I marvelled at what the season had to offer in the way of teachings, engulfed with spiritual wisdom. Suddenly, the sky clouded over and snow began to fall. The flakes at first were large but sparse. I removed my beaver skin mitts from my hands and raised my bare palms towards the sky. Snowflakes gently alit onto my skin, melting on contact. I began to pray, requesting healing and peace from the season. Very quickly then, the snow began to fall in torrents. My turned-up hands tingled and vibrated under the touch of the season. A big wind flew in. It travelled like a giant serpent through the dips, gullies and hills close to my circle. It was as if I was on the outside perimeter of a language unknown to me, spoken by the season but understood clearly by all life in a forest. The branches of the trees waved and swayed wildly, giving the appearance of long-haired dancers, draped in robes covered in fringes and ribbons. The leaves of a nearby oak tree rattled and shook, but most of them refused to loosen from their branches. 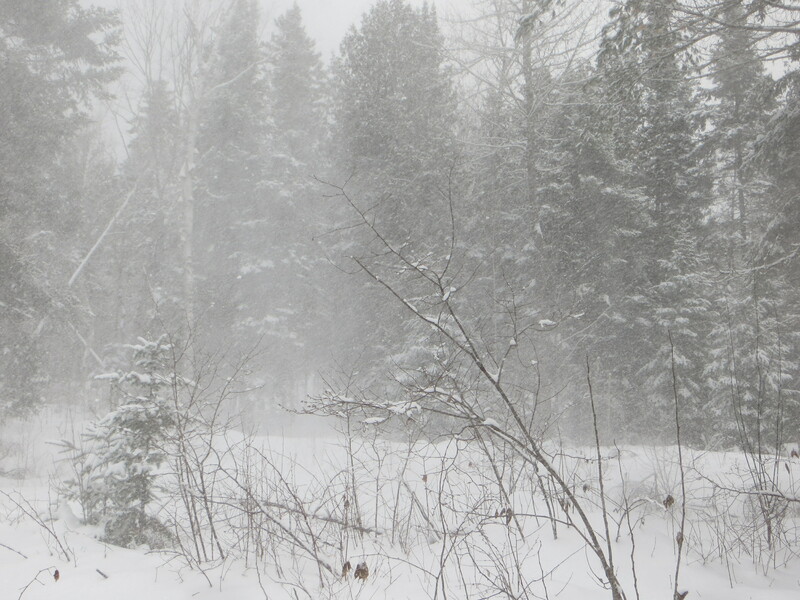 The powerful wind cleansed the branches of the spruce, balsam and pine trees of the piles of snow clinging to them. The sky became a swirling, mighty river made of chunks of snow, fiercely swallowing up all things in its path. My still turned-up palms felt like thousands of gentle tiny beings etched a spiritual dance into them. A caress I felt straight through to my heart and spirit. I laughed and prayed simultaneously, never have I ever felt such a remarkable sensation in my entire life. It was a blessing, granted me by the season of winter. It didn’t last long. All of five minutes later, it was over. I continued in prayer, my tobacco was placed down and I returned to my home to ponder further the experience given me by the season, the snow and the wind. This entry was posted in Community, Spirituality and tagged Albert Dumont, Algonquin, Anishinabe, Indigenous, spirituality, Winter. Bookmark the permalink. The beautiful earth brings us so many beautiful experiences when we are in acceptance of the beauty that comes in so many different guises. I love the metaphorical pictures you created in such a way that I was privileged to share your experience. I read this and afterward knew right away whose heart would open to it. I sent it tonight to him. Thank you, chi migwitch, for generously allowing us entry into this world which is always around us, maybe always ready to receive us. Thank you Albert for describing an experience that will resonate with many. Winter can be a time of deep stillness for humans as we watch the white world whirl around us. I was on a high for 2 days about 3 weeks ago when I saw an ermine in its winter coat as I walked beside the kitchi sibi. Beauty finds us when we make ourselves available to it! Thank you, Debra. Like all seasons winter serves a great purpose. She is very wise.